Most weeks, I take the time to go for a hike in the incredible Foothills Park. 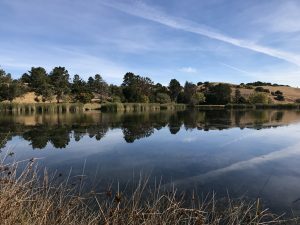 We are so blessed here in Palo Alto/Los Altos Hills alone to have so many options to get out – The Dish, Pearson-Arastradero Preserve, the Baylands, and the Lost Trancos Preserve, just to name a few. And of course, there are countless trails in Sunnyvale, Redwood City, San Carlos, San Mateo and beyond! I love Foothills Park (pictured left) for it’s diverse trails, stunning views and wildlife, lively lake, and well-placed benches (for meditation, of course!). When I’m there I am centered in nature, connected to the universe and feeling wonder. This experience never fails to connect me with my creative powers and bring out my next big idea, talking points for services, a new twist on an old class, or that perfect phrase. It turns, out, I’m not alone! In a recent study published last July by a Stanford student in the Proceedings of the National Academy of Sciences, a 90-minute walk through a natural environment had a huge positive impact on participants. In a survey taken afterwards, those people who took the natural walk showed far lower levels of brooding, or obsessive worry. Further, studies of the brain of those subjects showed less blood flow to the part of the brain directly linked to sadness, depression, and worry. I know for sure, the worry (and fear) block my creativity. When I let those go, I can be in the flow of ideas without judgement and self-criticism. Here’s what I do when i’m there to use the power of hiking, and the power of nature to unlock my creative powers! Put my phone away. Reception is bad up there, but this precautionary measure keeps me focused! Stop for a 5-10 minute meditation. I breathe in the beauty, breathe out fear, worry, negativity. this further deepens my connection and open my mind. Continue hiking – with a calm mind, i can use the swing of my arms and the flow of the trail to conjure up and refine my ideas, debate with myself, and put things into a flow. I don’t give up – when I get stuck, I go back to experiencing wonder and joy in the beauty around me, and focus on the rhythm of my steps. This frees my mind from stress of feeling stuck, and pumps creativity back through me. This is almost like a walking meditation, but my mind is definitely a little more active. Write anything down that I want to be sure to remember. I encourage you to follow suit. Get away, get outside, get creative!